Since the fall in the prices of 3D printers that occurred in the early 2010s, 3D printing has become accessible to everyone. Today individuals, professionals and institutions are massively equipping themselves with these new revolutionary prototyping and production tools to meet their needs: the fourth industrial revolution has well and truly begun! With prices ranging from €1,000 to €10,000 for good desktop 3D printers, now organisations of all sizes are being offered access to this technology, from individuals to multinationals through micro, small and medium sized businesses, as an R&D, production and communication tool. Democratisation does not stop at the size of the organisation. 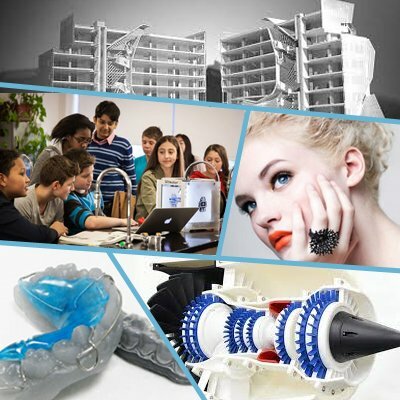 3D printing meets many needs and is becoming essential in virtually all industries: medicine, dentistry, industry and engineering firms, architecture, marketing and communications, aerospace, automotive, construction, artistic fields, fablabs, education, research, jewellery and watch making, etc. However, the 3D printing equipment sought meets different needs, constraints and requirements depending on the size and industry: technology, print volume, accuracy, materials, budget and speed are some of the variables to consider for a suitable purchase. We attach particular importance to understanding your 3D printing needs, so as to offer you the most suitable 3D printers and materials. That's why we wanted to review the 3D printer needs of the main industries that want to equip themselves with desktop additive manufacturing equipment. See a presentation of the needs for each sector, the possibilities and benefits of 3D printing, and our suggestions for the most suitable 3D printers!